I picked this up from the blog Gem of the Ocean. Did you know that the Little Flower, St. Therese of Lisieux, made a chasuble? I didn’t. The chasuble garment itself was made from an old dress of Madame Martins. It appears to be a heavy brocade type fabric. It is dark green in color. St. Therese painted the Holy Face and the vines and roses. The book, Therese and Lisieux, didn’t say who sewed the garment. You can see an enlarged version of the photo here. You can read more there! 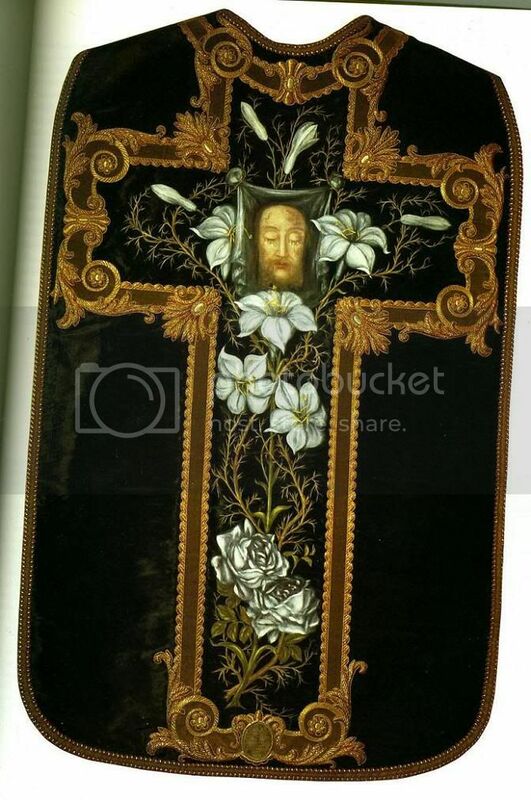 This entry was posted in Just Too Cool and tagged chasuble, Little Flower, St. Thérèse of Lisieux. Bookmark the permalink. That is so cool! I heard that St. Therese painted, but I didn’t realize how good she was at it. Thanks for sharing, Father! I saw it in Lisieux…beautiful! Imagine what she would have done WITH painting lessons! The picture comes from a book called “Therese and Lisieux” by Pierre Descouvemont and Helmuth Nils Loose. I have this book and highly recommend it – it’s on the pricey side, but packed with many photos and vignettes and details of her life I had not seen elsewhere. If it came from an old garment of her mother’s, then I guess that makes it a second-class relic twice over. Therese’s sister Celine did a beautiful painting of the Holy Face taken after the Shroud. Great! I hadn’t seen this before. There is a painting of Les Buisonnets by Celine in the kitchen there. Her full name in religion is often not used: (Sister Theresa) of the Child Jesus and the Holy Name. That’s beautiful!! I didn’t know about this either. Thanks so much for sharing this Fr. Z! My daughter is learning about St. Therese right now, and I’ll be sure to add this, if it isn’t mentioned in one of the books she’s reading. Zelie Martin was an accomplished lace maker. It seems as though her daughter inherited her artistic skills. I meant, of course, Sister Theresa of the Child Jesus and the Holy Face. That would have made my original post ad rem.